The concept of the tree of life, wish fulfilling tree exists in many cultures. In India the word used is kalpataru or kalpavrikhsha. Also known as Kalpadruma, it is a divine tree in Hinduism. It has been mentioned in Sanskrit literature like Manasara, part of Shilpashastra and Jain cosmology. Some depictions in art are mentioned herein from Sanchi in Madhya Pradesh and Karnataka in India and Java in Indonesia. The birth of the kalpavriksha happened during the samudramanthan or churning of the ocean as per Hindu mythology. Along with the tree, the wish fulfilling cow kamadhenu was also born. 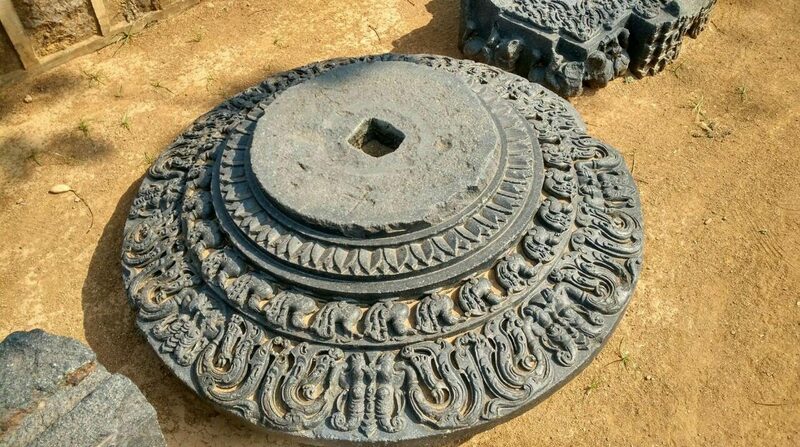 Lord Indra is supposed to have taken them to heaven, devaloka, along with him and planted it there. As per mythology there are five kalpavrikshas; mandana, parijata, santana, kalpavrikhsa and harichandana. All these are believed to grant different wishes to the devas or gods and out of jealousy the asuras or demons waged wars with them. Lord Shiva and his consort Parvati gave away their daughter Aranyani to a Kalpavriskha for safekeeping when the demon Andhakasura waged war, with a request to bring her up as Vanadevi, or protector of forests. Another daughter Ashokasundari was created from a Kalpavriksha to be a companion to Parvati during period of loneliness. The banyan tree or nyagrodha is called kalpataru; the coconut tree whose every part is utilised by human beings for various purposes,the ashwatha (fig) tree, believed to be sacred, mahua tree, shami tree or jaant of Rajasthan which stays green always and checks soil erosion is also referred to as kalapataru. A variety of palm is considered as kalpataru in Tamil Nadu in India. The Baobab or Parijata tree is called kalpavriksh in Uttar Pradesh, believed to have been brought by Arjuna, one of the main Pandavas from the epic Mahabharata. The Great Stupa at Sanchi in Madhya Pradesh, India has many depictions of the bodhi tree which is shown as being worshipped for its association with Lord Buddha. The bodhi tree is an akshaya vata, eternal, life giving tree. Originally commissioned by King Ashoka in 3rd century B.C many structures were added to the stupa complex by other dynasties. Scenes from Lord Buddha’s life are sculpted on the toranas (gateways) and other structures in and around the stupa. Sculpture at Sanchi, Madhya Pradesh. Photographed at the Sanchi Hill, Raisen district of the state of Madhya Pradesh, India. A Hindu temple at Java in Indonesia Candi Prambanan from the 9th century is dedicated to the trinity of Brahma, Vishnu and Shiva. The temple has pointed architecture with a large complex of many individual shrines. The epics Ramayana and Bhagavata-purana are depicted along the inner balustrade walls of the main shrines. The kalpataru is depicted on the lower outer wall niches. Kalpataru guarded by Kinnara and Kinnari, mythical beings at Candi Prambanan, Java, Indonesia. Kalpataru and Kinnara, Siva Temple, Candi Prambanan, Java. Kalpataru and peacocks, Vishnu Temple, Candi Prambanan, Java,Indonesia. Photograph from Prambanan temple compound near Yogyakarta in Java, Indonesia taken by Anandajoti. Kalpataru and lions, Nandi Temple, Candi Prambanan, Java,Indonesia. Kalpataru and monkeys, Brahma Temple,Candi Prambanan , Java, Indonesia. In Jainism too the kalpavrikshas are wish fulfilling trees. There are ten such trees who grant different wishes. The madyanga trees provides delicious drinks, the Bhojananga provides great food, yotiranga gives light, dopanga gives indoor light The others include pananga, turiyanga, bhusananga, vatthanga, alayanga, diviyanga who provide music, ornaments, mansions, utensils etc. 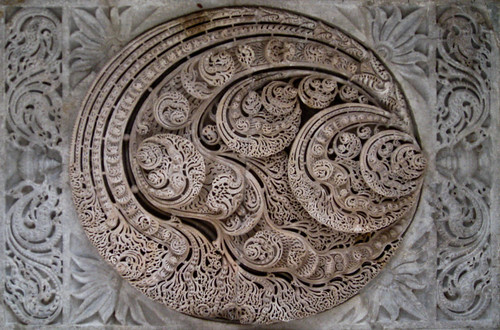 Kalapavriksha carving in marble, Jain temple at Ranakpur, Rajasthan, India. This entry was posted in Ancient Indian history, art history, asian art, Buddhist art, Flora, hinduism, history of india, kalpataru, kalpavriksha, sculpture of india and tagged Ancient Indian history, kalpataru, kalpavriksha, nature on December 6, 2016 by historyreads.